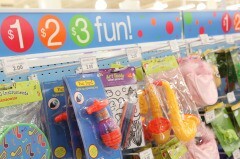 Toys R Us has come up with a cool way to help parents treat their kids to a cheap toy by creating a central location in their stores for toys priced at $1, $2, and $3. The new section called "$1-$2-$3 Fun!" launches today at Toys R Us stores across the country and will offer 100 items in this price range. On top of being a cheap way to pick up a toy for your kid this is a cool way to begin to teach them the value of money. If you hand your kid a $5 bill and send him to the Funshop he will quickly learn that he can choose quite a few different combinations of toys with his five-spot. You can even open up the toy search to the entire store, teaching him what he can get if he saves his money for a few weeks. I think this lineup of cheap toys is a cool addition to the Toys R Us stores since it focuses on toys that require a bit of imagination to use, something many high priced toys lack these days.